Durango sophomore quarterback Jordan Woolverton pitches the ball to running back Everett Howland during the first half Thursday against Palisade at Grand Junction’s Stocker Stadium. Shellshocked was one way to describe how the No. 7 Durango High School football team felt in the opening minute of the first quarter against No. 4 Palisade in a Class 3A top-10 clash Thursday night at Stocker Stadium in Grand Junction. Before the Demons knew what hit them, Palisade was up two scores only 65 seconds into the game. That was all the Bulldogs needed to pull off a 20-3 victory over the Demons. 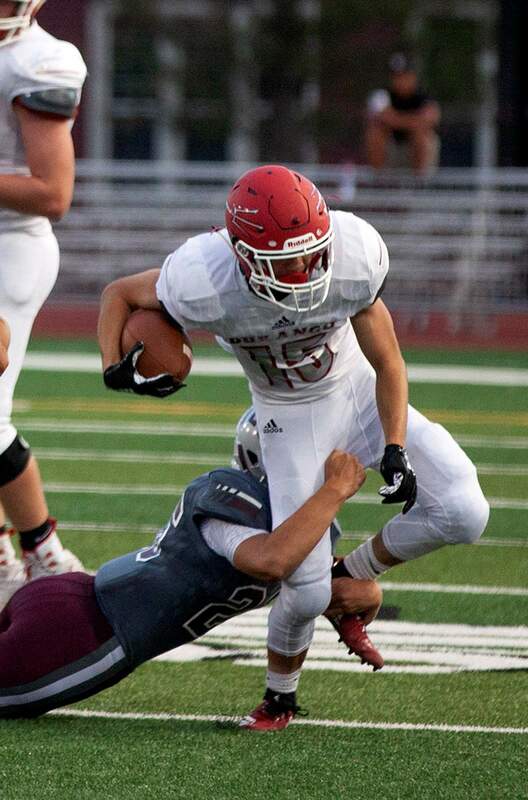 On the game’s very first play, Palisade’s Jacob Bruce scored on an 86-yard kickoff return. Two plays into the Demons’ first possession, sophomore quarterback Jordan Woolverton threw his first interception of the season. Safety Cam Tucker returned it 25 yards for a touchdown to give the Bulldogs (1-0) a 13-0 lead in a flash. Durango head coach David Vogt was just as stunned as his team. The Demons (1-1) were not able to find their rhythm in the first quarter, and, following the interception, running back Dawson Marcum was stripped of the football. The Demons’ offense did a complete turnaround from last week’s stellar performance in which they scored five times. Even in the second quarter, the Demons struggled to gain any rhythm. Just before halftime, Durango had a drive that stalled at the 20-yard line. On fourth down, Woolverton found an open Kiernan Mcinnis with a pass that would have given the Demons a first down in scoring range, but Mcinnis’ foot was out of bounds, and Durango went into the locker room down 13-0. 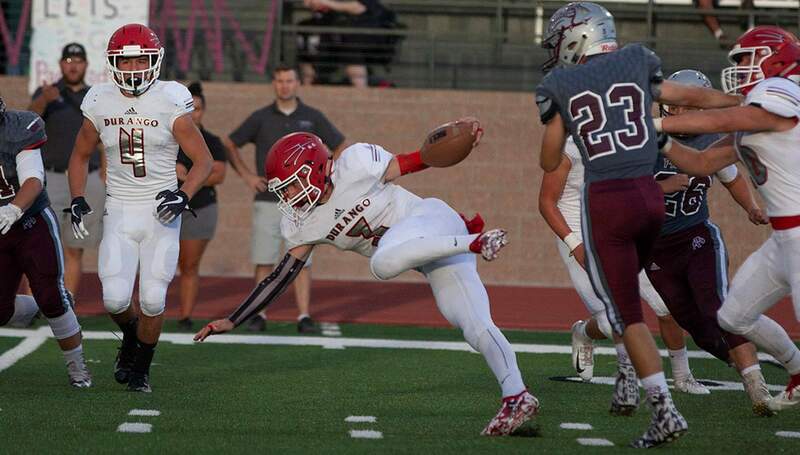 Dawson Marcum and the Durango offense got tripped up in the first half against Palisade on Thursday night at Stocker Stadium in Grand Junction. The third quarter had a hint of optimism, as the Demons drove to the 12-yard line and had consecutive penalties, eventually settling for a 30-yard field goal from junior kicker Caleb McGrath that cut the deficit to 13-3 with 6:38 to play in the third quarter. After senior linebacker Gus Kidd recovered a fumble late in the quarter, Durango had field position at the Palisade 34-yard line. But the Demons drew two penalties, including a holding call. It was the story of the night, Vogt said. Vogt pointed to fundamentals, too. In the fourth quarter, Durango punted twice and turned the ball over on downs twice. On the team’s opening drive of the fourth, the Demons were in good field position when a snap went through Woolverton’s hands. He had to take a 19-yard loss on the play. Alex Hise and the Durango Demons found some rhythm late in the first half after a tough start Thursday night against Palisade. The Demons especially hurt their chances after appearing to convert on fourth-and-long, only to be called back after an illegal block in the back by a lineman. 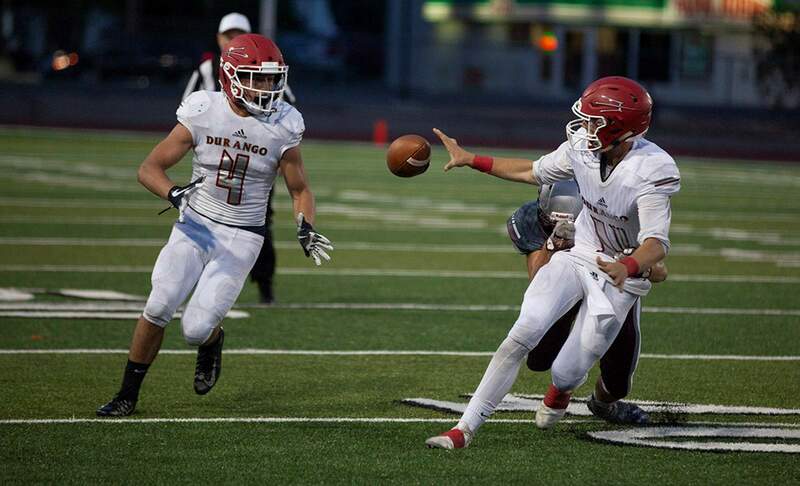 On Durango’s next possession on another fourth-and-long, Marcum faked a punt, ran 20 yards and still came up two yards short of the first down. Meanwhile, Palisade’s Bruce wore down the Demon defense late and converted on a fourth-and-3 to extend the drive. His quarterback, Tucker, later sealed the game with a 3-yard score to make it 20-3. The schedule will not get any easier for the Demons, as they will host Class 4A heavyweight Montrose at 7 p.m. Friday, Sept. 7, at Durango High School.